Me: Chrissy! *pounce hug* It’s been too long hon. Come in come in. *flops on couch* Get cozy and lets catch up. I haven’t hugged you since the Romantic Times Convention in May. Gahhh… This summer has flown by. Oh! I have snacks of course. *grabs a handful of gummy bears* help yourself. Chrissy: Remember, my vices! Coffee and Chocolate! *laughs* On a serious note, it was FANTABULOUS meeting you at RT. So much fun. I am so glad we got to hang! We must do it again! So what have you been up to this summer? Any fairground food or farmer’s market-y activities? I’ve only been to the farmers market once this summer… and it’s almost over. Gahhh 😛 I need more kettle corn! Chrissy: Writing, writing, writing. No vacations for me over here, I wrote a 70k book in 2 months! Trying to do it again over here! Me: Geez Louis Girl! I mean, well… I love the stories but meep! 😀 you need more chocolate. STAT! an Pete protect his witness and solve the case, while fighting the intense heat with Nikki? Me: You, my darling are a Jane of all trades genres! YA Fantasy with your Swords Call series, Romantic Suspense and paranormal oh my. <g> What are you working on now? Chrissy: Hehehe, thank you! 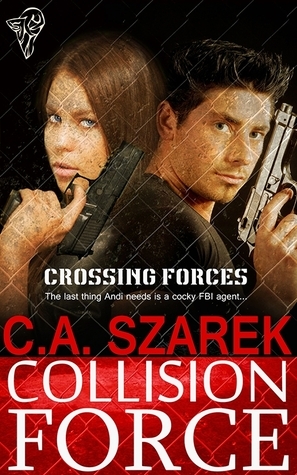 I am working on Crossing Forces Book Three, Calculated Collision AND book 4, Collision Control. Yes, I am writing them at the same time. I am a totally glutton for punishment, but certain characters *glares at the hero of book 4* won’t SHUT UP in my head. I will start fantasy book 3 when I am done with these two. It doesn’t have a title yet, but I know who it’s about and I have two scenes written. My next release, as I had mentioned, is Love’s Call (King’s Riders Book Two). Chrissy: I *just* did a cover reveal. You can see it on my blog! OMG! I need to tell you about this! For everyone who loves Andi and Cole, they will have a CHRISTMAS Story! It will be A FREEEEEEEE download on my publisher’s website, as well as in their Nov newsletter. I am so excited! Me: Awwww…. YOU are such a tease! I love it! More Chrissy! 1. What book did you just finish? 2. Are you a good cook? Yes. I don’t care for cleaning up, tho. 5. What football team do you support? 6. What do you have on your fridge door? I collect magnets! I love author book cover magnets, I have TONS. 7. Can you impersonate anyone famous? 9. What would be your dream car? Me: Nice! You are a dear and I adore you to the Muchness! Thank you so much for hanging with my on my virtual couch. I’m excited you have a couple more book birthdays this year so we can play again soon. PS. Chrissy’s giving away an ebook of Collision Force! Go forth (or really down) and enter! What: C.A. is gifting one lucky commenter with an ebook of Collision Force!!! Thanx Laurie! I wish you your dream car! I love action and suspense with my romances, C.A., so this sounds like my favorite kind of read. I think action and suspense make everything else sizzle and keeps my interest going throughout the entire book…all the way to the end. I’m driving my dream car right now: A Honda Odyssey. It feels safer than a small car and it rides like a dream…plus I love the side and rear doors that open with a button on my key ring! Gets great mileage and me and my Yorkie, Maggie, can even sleep in it if we go away for a short road trip. Thanks for asking! LOL I love that you own your dream car! That’s awesome. I like what I drive now, but I would sure love a new Dodge Challenger (Cole’s car in Collision Force). I have two dogs, and I ADORE them. Hope you love CF when you pick it up…especially if you WIN it! I WOULD LIKE A CORVETT OR MUSTANG. THANKS FOR THE GIVEAWAY! I love Mustangs, too! Thanx for stopping by Shelley! My dream car is a Range Rover.